This is our last episode before the two-hour season finale next week, and things are certainly heating up for our favorite agents. We saw the aftermath of Captain America: Civil War, including Coulson's trepidation about the Sokovia Accords. We got a few nice Mack/YoYo moments, discovered more of Hive's plan, and saw the return of a certain favorite antihero I've grown to love. ★ The nice Civil War tie-ins, though I honestly wish there would have been more. Then again, it's very hard to live up to the way Captain America: The Winter Soldier tied into Agents of S.H.I.E.L.D. (aka by wrecking everything forever). ★ Lincoln. Honestly, I'm impressed that he managed to redeem himself a little in my eyes this week. When he started talking to Daisy, I got so annoyed, but I'm glad it was all part of his master plan. Kudos, Lincoln. ★ Thankfully, Daisy's back. I'm so relieved, but I'm worried about the fallout. But mostly relieved. Let's all take a collective sigh of relief, everyone. ★ I love that Lash came back, and his showdown with Hive was amazing... until the end of it. I'm so, so sad he's gone. Please, no. ★ Also, James, you're officially on my "naughty" list. ★ The pacing of this episode was kind of odd. I found myself bored at some parts. ★ I both love and hate the Primitives. They're terrifying but very well done. ★ Lash's death. Enough said. ★ That ending scene, which was cute but also absolutely not okay. I'm not surprised as much as I am WORRIED. If Mack's the one who dies... I don't even know what I'm going to do. ★ The fact that, as of this week, Marvel's Most Wanted was canceled (along with Agent Carter!!!). We've already had Hunter and Bobbi written off of AOS, so what are we supposed to do now? 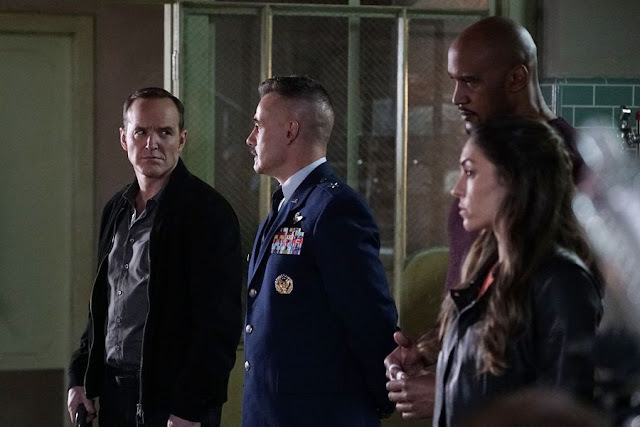 While this episode was a bit of a disappointment in comparison to the past couple of weeks, we still had several good moments, and I'm just relieved that Daisy's back safe in S.H.I.E.L.D. 's hands. Of course, I'm not too relieved yet because next week, it's about to go down. What did you think of "Emancipation"? What do you think is going to happen in the finale? Who's the fallen agent?